Where to get Botox injections in Modesto, CA? Both of them at Surgical Artistry, Inc specialize in Botox and other cosmetic injections (such as Juvederm). Dr. Calvin Lee administers the majority of Botox and Juvederm/Voluma/Belotero Filler cosmetic injections. See Dr. Calvin Lee's background on his personal Modesto Botox website and Modesto Botox News. picture from 2009. He's pretty good with needles. What's the background for Dr. Calvin Lee, Modesto surgeon, and why choose him for your Botox treatments? His focus is Botox and filler cosmetic treatments. 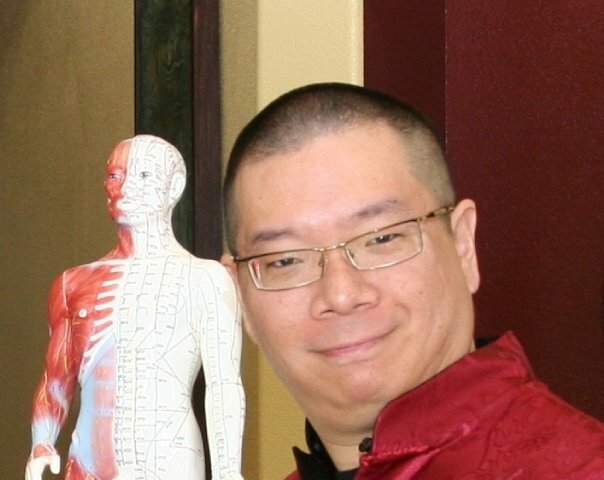 His other focus is vein injections and acupuncture which all involve needles. He works very frequently with needles. He was chosen by Allergan to give lectures in the Northern California Region. Visit our Latisse Modesto web page. He has a Sc.B degree in neuroscience. Botox is a neuromodulator, and the science of Botox involves much of neurosience. He was consider top 1% at Brown University (University Scholar award). He was accepted to Harvard, Stanford, and Yale universities (he chose to enroll at Brown University). He teaches for UC Davis - he teaches other resident physicians. He received a teaching award (Community Teacher of the Year) for this in 2006 (associate professor for UC Davis in 2006). He is married to Board Certified Plastic Surgeon, Dr. Tammy Wu, who graduated top of her medical school at Brown University, who practices in Modesto. They frequently discuss strategies for continued improvement with Botox injections. Dr. Tammy Wu is also a board member of CAP - Cooperative of American Physicians, a professional liability company based in Los Angeles, California. See more information on Dr. Calvin Lee, Modesto Surgeon who specializes in Botox and Juvederm/Fillers. Platinum level with Botox/Allergan. This is based on amount of Botox Cosmetic and Allergan products purchased by our account. This is top 1% of all their accounts (information from Allergan). Botox blocks impulses from nerves which causes the muscles to contract. The muscles then would remain more relaxed and the skin overlying these muscles would remain unwrinkled, and thus have a smooth appearance. Untreated muscles would continue to contract as before which leaves normal facial expressions alone. Botox for cosmetics is used to reverse visible signs of again. There's more detail about how botox works below, and in the section "the science behind Botox." What conditions do we treat with Botox in our Modesto office? Some of the treatments above are considered off-label Botox treatments which have not been evaluated by the FDA. What can one expect during Botox treatment at our Modesto office? Treatment with BOTOX® Cosmetic is relatively simple and safe. A series of small injections are made using a tiny micro-needle and very small amounts of liquid. These injections are very precisely located into the nerves that cause character lines. No anesthetic or other pain medication is necessary since the procedure causes very little pain. Some compare the injections to a small bug bite, or a slight pinch. You may feel free to schedule your BOTOX® treatment for lunch hour or after work since driving after the procedure is not a problem. How much does Botox cost in our Modesto office? This of course varies depending on how much Botox is needed. In general BOTOX® Cosmetic injections costs about $120-$350 per area at Surgical Artistry, Inc in Modesto (Dr. Tammy Wu's Office). Injections of Botox are done by Dr. Tammy Wu, MD Board Certified Plastic Surgeon and Dr. Calvin Lee, MD Board Certified General Surgeon. Dr. Calvin Lee currently does most of the Botox and dermal filler injections. Find Dr. Calvin Lee's website by searching Google for "Modesto Botox Calvin Lee"
According to national surveys done by the American Society for Aesthetic Plastic Surgery, the average cost of a single BOTOX® cosmetic treatment was just about $400 in 2002. If you are having more than one site treated, then the cost may be higher. Update: As of April 2, 2015, Botox injections with Dr. Calvin Lee will be increasing to $12 per unit of Botox. You can expect the effect of your BOTOX® treatment to last anywhere from three to four months. As acetylcholine production returns to normal, your muscles will once again begin to contract and the wrinkles will reappear. That's the bad news. The good news is that your wrinkles may be less prominent after BOTOX® treatment because your muscles may be somewhat "trained" to be in the more relaxed state. As the wrinkles reappear, you will have to have repeat BOTOX® treatments to get them to disappear again. What are some side effects and complications of Botox Cosmetic? The most common side effect of BOTOX® treatment is temporary bruising. Another side effect is headaches, however this is a rare occurence. If headaches do occur, they are usually gone within 24 to 48 hours. A small percentage of patients develop eyelid drooping. If eyelid drooping does occur, it is usually gone within three weeks. The eyelid drooping is caused by migration of the BOTOX® from the treated area to an adjacent area. This is why you shouldn't rub the treated area for at least twelve hours after your BOTOX® procedure. What are some statistics of Botox Cosmetic usage? Chemical peels accounted for 556,172 procedures in 2005, down 50 percent from 2004. What's the science behind Botox? Botox blocks the transmission of acetylcholine from neurons innervating muscle. Acetylcholine is a neurotransmitter which send a message to the muscle telling it to contract or tense up. With the flow of acetylcholine blocked or significantly reduced, the muscle can no longer retract and it relaxes. As a result, the wrinkled areas smooth out and soften. Women who are who are pregnant or breastfeeding should not have BOTOX® treatment. People who have neurological diseases should not use BOTOX®. Dr. Tammy Wu is a Board Certified Plastic Surgeon. What does it mean to be a board certified plastic surgeon? People who are considering cosmetic surgery are often advised to consult a board-certified plastic surgeon. But what defines a “board-certified plastic surgeon”? In the United States, such surgeons are physicians who hold a certification with the American Board of Plastic Surgery (ABPS). The requirements for certification include: graduating from an accredited medical school, completing a residency of at least five years, having (usually) three years of experience in general surgery, actively practicing plastic surgery for at least two years, and passing comprehensive written and oral examinations. A surgeon who fulfills these requirements is referred to as a diplomat of the ABPS. The advantages of choosing a board-certified plastic surgeon are numerous. ABPS diplomats have extensive skill and experience in a wide range of plastic surgery procedures including (but not limited to) treatment of congenital and acquired defects in the face and body, aesthetic (cosmetic) surgery of the face and body, burn management, reconstruction by tissue transfer (grafts), surgery to treat growths in the skin and soft tissue, and microsurgical techniques applicable to plastic surgery. These surgeons have undergone years of extensive education and rigorous training to attain proficiency at providing comprehensive patient care, and they have proven their competence to a board of experts. Essentially, an ABPS certification ensures prospective patients that the doctor possesses the required skill level to competently perform plastic surgery. There are other doctors that have titles and certifications that may even have the words "cosmetic" and "plastic surgery" in them. However, there is only one board of plastic surgery, it is the ABPS (American Board of Plastic Surgery). Dr. Wu, Modesto Plastic Surgeon is the medical director for Surgical Artistry, Inc. She injects Botox as well, you can specially request her, but Dr. Calvin Lee (Board Certified General Surgeon / Trauma Surgeon) is the main injector of Botox for Surgical Artistry since 2007. Both doctors inject Botox well, but injecting Botox is an art and they have slightly different approaches. Realself Botox reviews - the good, bad and ugly. Hyperhidrosis webpage at MayoClinic, Botox is a treatment for excessive sweating - lasting 9 months - over a year. Call us at (209) 551-1888 to schedule your Botox appointment.